It was not just the people of the Bronze Age who liked to carve figures into the flat rocks of Bohuslän. 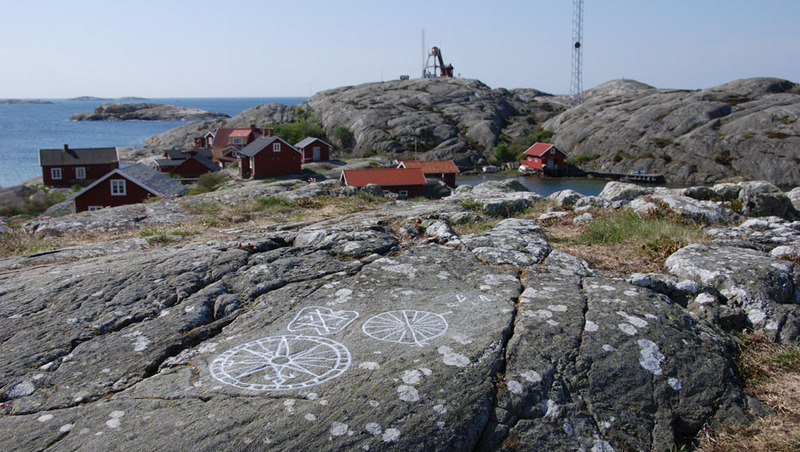 Seafarers of the 16th and 17th century would also carve their marks, initials, dates, compass roses or shields when putting in at natural harbours along the Bohus coast. Today we know of around twenty sites with maritime carvings, from Vinga in the south to Koster in the north. Maritime carvings can be found on flat rock surfaces at sheltered natural harbours along the entire Bohus coastline. From the Middle Ages into the 18th century natural harbours were used by ships for putting in overnight or for seeking shelter and the carvings were done by seafarers as a sort of visiting card. The most common form of maritime carvings are merchant’s marks, followed by initials, personal names, dates, compass roses, place names, and heraldic shields. Merchant’s marks were symbols used to indicate identity, possession, ownership or manufacturer and became increasingly common in the middle ages, especially amongst tradesmen. The use of merchant’s marks peaked in popularity during the 16th and early 17th century and was common to all social classes: maids and farmhands, farmers and nobility, fishermen, seamen, craftsmen, – as well as men and women in the trade business. Trade was intense during this period. Merchants from the Denmark-Norway union and from the Hanseatic towns along the Baltic coast and the Netherlands plied their trade along the Bohus coast. The fishing also attracted many fishermen and traders to Bohuslän, especially during the herring boom in 1556-1589. The oldest known maritime carvings are in the form of heraldic shields and date back to the end of the 15th century. These carvings are found on the islands of Hamnholmarna in the Fjällbacka archipelago. Next to the shields is the oldest known carving of a date, the year 1500, which was discovered in 2014. There are plenty of carved dates from the 16th and 17th centuries, but only a handful from the 18th century. The reason for this is most likely that the ships got bigger and were fitted with better navigation devices, which meant that they could go further out from the coast and also that they could sail at night. The natural harbours no longer played the same important role as before. Merchant’s marks, dates and initials, as well as the Danish place name Horsens. Documented in 2016 at Hamnholmarna, Bohuslän. There are around twenty sites with maritime carvings along the westcoast of Sweden, from Vinga in the south to Koster in the north. Many of these sites coincide with natural harbours marked on old charts or described in historical texts. Such sites include Mollösund and the islands of Käringön off Orust, Buskären off Smögen, Hamnholmarna off Fjällbacka and Koster off Strömstad. Maritime carvings have also been found at the natural harbours off the Sörlandet area and outside Trondheim in Norway, in the Roslagen archipelago in the province of Uppland, and in the southern Finnish archipelago. The islands of Hamnholmarna are the largest site with maritime carvings in Bohuslän and one of the biggest localities in the Nordic region. This site has several hundred carvings. Bohusläns Museum has a long-standing involvement in the history of this coast and its shipping. In 1999 an inventory was taken of sites with maritime carvings as part of the Blå Skagerrak [Blue Skagerrak] cultural tourism project. From 2010 onwards we have been focusing on certain localities and on documenting the carvings there. To date we have documented the carvings on the islands of Väderöarna off Fjällbacka and Buskären and Hållö off Smögen. 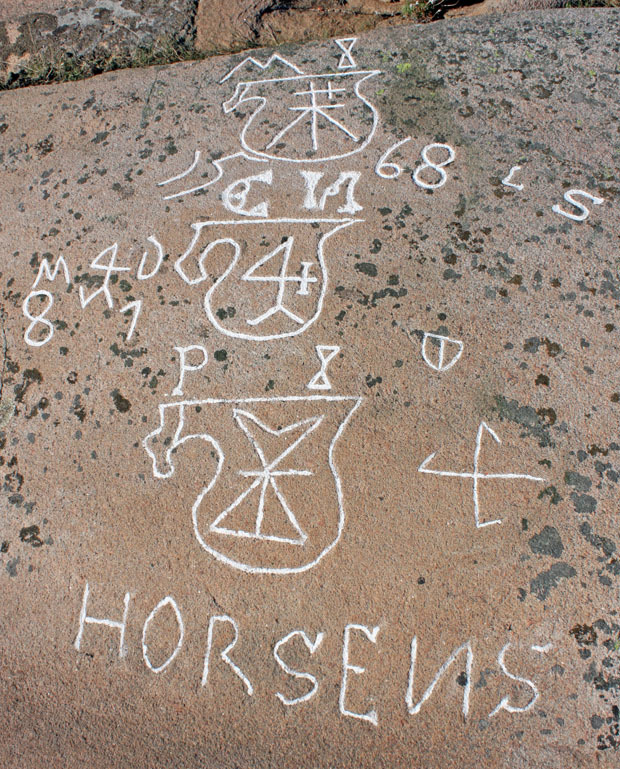 In 2014 work began on documenting carvings at the largest site, Hamnholmarna. In the process of these documentations we have concluded that the carvings often appear close to where the ships landed and the crew went ashore, as well as on the highest hill near the harbour. From the highest point compass bearings could be taken and courses plotted, weather conditions could be observed and other ships sighted. In addition, carvings of compass roses are commonly found at the highest point. We have noted that most of the carvings were done using tools made from metal, such as chisels of varying widths. A few marks have been made with tools made from rocks and have been tapped into the rock in the same way as prehistoric rock carvings. Some carvings have been damaged by wear or decay. Decay occurs when the rock surface is exposed to wet and windy weather or lichen growth. The rock becomes rough and large bits may fall off. This process may damage or destroy rock carvings. In some natural harbours that are popular amongst pleasure boat owners, carvings may be damaged by wear from pitons, disposable barbecues and from people walking on them. Such wear often happens accidentally and may be due to the carvings being covered by lichen or otherwise hard to spot. We are working to preserve and protect the carvings through documentation, cleaning, and providing information. The carvings can also be painted using durable paint to make them more visible. Please feel free to contact us if you have any questions regarding maritime carvings or if you would like to report a find of maritime carvings on the Bohuslän coast!